Winter Carnival slated for January 16, 2010. Long Lake is where it is at for Winter Fun! Edited by Victoria Sandiford. Thursday, Dec 17th was brisk, but from the comfort of a car with heated seats the judges began their two and 1/2 hour journey combing the streets of Long Lake for the winners of 2009 Holiday Decorating Contest. We suggest you take a cruise around, and make a list of the 46 homes decorated and submit it to the Tourism office and we will give you a candy cane. Sorry the pic above is not an actual house in Long Lake, pictures will be uploaded, but the camera froze so pictures will be forthcoming. We appreciate your patience. 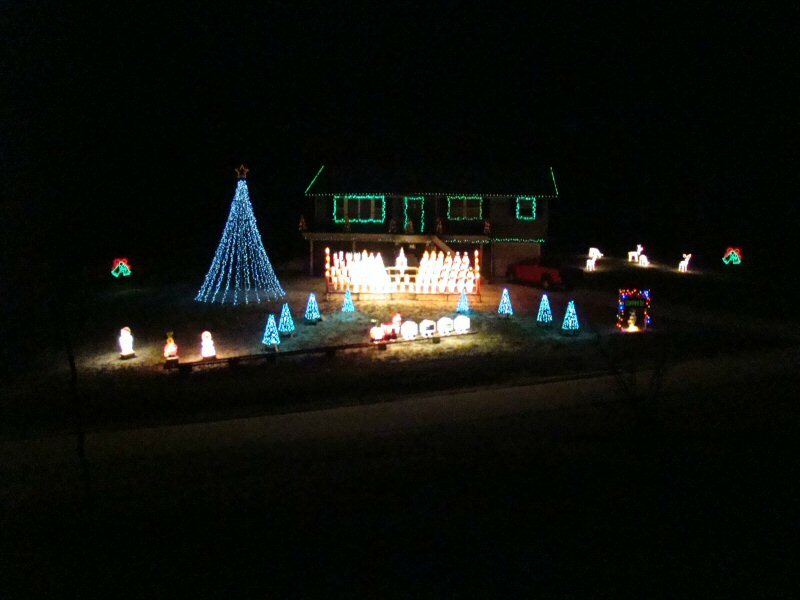 1st place Bill Ellick “Long Lake Lights” MUST see this display with music – tune into 87.9 and enjoy the show. Up on Cemetery Rd… dont miss out on this extravaganza. Bill invested time, & voltage to make his home a destination on the hunt for the Christmas spirit. Make it a point and GO GO GO… don’t miss out on this special experience. Opens at 6pm and runs to 9:30pm weekdays and til at least 10pm on weekends… check it out! 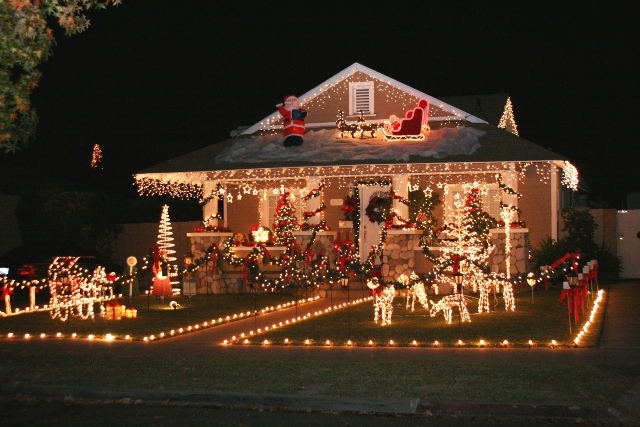 2nd place Chris & Stacy Howe – The precision and perfection of the linear light display is striking. Pay attention to the detail, wrapped three sides of the house, up the chimney and complimented with Santa’s train. 3rd place Dave & Vicky Snide Fun Festive, Bright, and a friendly Snowman on the front of the house to entertain the viewers on the other side of the lake. Their display incorporates other buildings on the property. 2nd place Long Lake Diner/Owls Head Pub Blinking lights, careful wrapping of windows, coordinated light display make this a destination for anyone looking for the fun spirit and lightness and community spirit of the holidays. 3rd place MDRM Industries / Mike & Jacquie Rivette Traditional, & classy, the building is decorated on both sides and peek through the windows to see the golden glow of the Christmas trees. Next year get ready for the Town vs. Town competition… you have been warned! Let’s dress up this town and show outerspace that people really do live here! As the logging trucks rumble by, the plows upon plows continue to battle the storm, one takes a moment to appreciate the strangeness of change. One moment tufts of grass peak up under the frost, the next moment, the car is stuck in the driveway. Events for the weekend are all abustle. Snowball tomorrow night in Tupper Lake, which is great to celebrate the massive snowfall, powder looks amazing. Community chorus performs in Newcomb at 7:30pm tomorrow and at the Long Lake Town Hall at 8pm on Saturday night. If machines and new snowmobile gear tickles your fancy, check out Snodeo, sponsored by the Central Adirondacks Association in Old Forge at the Pavilion. New models, trail maps, gift bags, kitty cat races, fun for all. Then hop in the car for some exploration and settle in for the night at one of Long Lake’s fine lodging. But the most imp0rtant thing.. dress up this town, we need the lights on. Please cheer our little place up, participate in the Holiday decorating contest… judging is 0n Thursday! If you know someone that perhaps owns a place… nudge them a little, come on, tell them how much it is appreciated. Rules for living in Long Lake. Leave heat on an ooch higher than normal when leaving for work (in case of power outage) Strap down all decorations… wind predicted… Get out all manuals to learn how to put ice on skating rink and make a nice smooth surface. Dig out all gloves, snowpants, boots, scrapers, shovels. Appreciate the mini sidewalk snow pusher that clears off the snow… call the snowplow man, naw… I will just walk to work. Consider investing in snow tires. List complete. Now for happenings..
Santa is coming. check out # for details on sign up etc. Reserve week in February for the kids… we are calling it Winter Wacky Week. Loads of activities to get the kids and adults out of the house and taking advantage of the winter wonderland. Feb 15-19th special events are planned. Time to get in the holiday spirit. Snow started flying yesterday leaving a thin coating. We had a bit more dust the streets starting up this afternoon. Members of the community are starting to light up their houses, but we are still waiting for sign ups for the contest! Little Bus travels to Tupper Lake on Friday night, leaving Town Hall at 7pm. The Yod Squad will be playing and ARISE will be making money to support the re-opening of Big Tupper. Gearing up for icing up the rink, looking at getting our skates back from the sharpener. No rental fees, come on to the rink and skate, borrow town skates. January will see Winter Carnival, Lake Eaton Fishing Derby, Mike Norris Fishing Derby in Raquette Lake… Fireworks and Festivus. Game on in Long Lake. The Town of Long Lake invites residents & businesses to participate in a decorating contest. Judging for cash prizes will be on December 17th at darkness, but you must call 624-3077 to sign up for consideration. There is also a contest in Raquette Lake, no sign up necessary. Also Bill Elick has a rockin’ display up on his house on Cemetery Rd. Weeknights 6pm – 9:30 and weekends 6 – 10 (check #) The website has info about the radio frequency to hear the coordinated music to the show. The public is invited to see the spectacle. The Annual Creche Lighting is on Sunday, December 6th at 11:30am at the Town Hall. Town only has three figurines for the set, so anyone looking to upgrade the look of our manger cene is welcome to help us out. The price for each new figure starts around $200 a pop and they are hard to find. We need the wisemen, the animals.